At Jamnabai Narsee School we strongly believe in academic rigour right from pre-school through reading, developing research skills, teaching through innovative strategies, consistent effort, perseverance through time constraints and periodical evaluation. All these are undertaken to equip the child to be ready for challenges. To ease any pressure that may be caused by academic rigour, the students were continually encouraged to participate actively in a variety of co-curricular and extra-curricular activities. These activities were not only pleasurable for the students but also helped to develop their overall personalities. The vision of our founding fathers, Shri Chatrabhujbhai Narsee, Shri Pratapbhai Narsee and Shri Dharamshibhai Narsee, of 'Excellence through Endeavour' has been realised through the versatile achievements of our students at the ICSE/ISC Examination 2017. It is gratifying to be the recipient of several first time national and international awards such as the British Council ISA (International School Award) 2016-2019. The school provides the necessary support to students to be able to undertake training that is essential to emerge champions in national and international sporting and cultural arenas, while never compromising on academic excellence. This year in particular we emphasised on effective evaluating methodology and the review pattern which led to the stupendous results in the 2017 Board Examinations. We take great pride in the success of our students. The passionate involvement of the teaching as well as non-teaching staff members in the progress of our students is exemplary. The parents' support in all our endeavours strengthens our belief in making a difference in the students' lives. We express our gratitude to the JN-PTA for organising meaningful interactions between experts and students / parents. 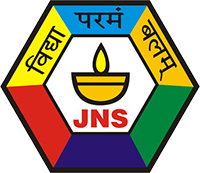 The JNAA has also striven to keep the school's presence prominent on the world map. This kind of academic rigour can be maintained through the contribution of every stakeholder of the school. "There are far far better things ahead than any we leave behind. "- C. S. Lewis.